Alex Geiger was sworn in as a Grover Beach officer on Oct. 8. Just over one month later, Geiger, along with Grover Beach Senior Police Officer Matt Goodman, sent a proposal to Police Chief John Peters requesting he put together a K-9 team. Then on Dec. 13, Geiger’s Belgian Malinois, Neo, attacked Betty Long, 85, in front of her Grover Beach yard. Long’s neighbor, David Fear, went to assist the woman, and the Belgian Malinois turned his aggression on the Grover Beach man. Long suffered a broken pelvis and broken shoulder. After leaving the hospital, the elderly woman went to a rehab facility. Prior to coming to Grover Beach, Geiger worked for the Kings County Sheriff’s Department and the Exeter Police Department. In Exeter, Neo was a trained police dog, and Geiger was his handler. Geiger joined the Exeter K-9 unit just one year after becoming a member of the city’s police department. Law enforcement agencies tend to require officers to work for seven years or more before joining the K-9 unit. Sources from within the Exeter Police Department also told CalCoastNews that Neo had some training and behavioral issues. In September, as Geiger was leaving Exeter, he purchased Neo from the Central Valley city for $5,287.50. Geiger brought Neo to Grover Beach as his personal pet. But, on Nov. 10, Geiger and Goodman requested that Peters create a Grover Beach K-9 unit. The officers’ proposal included a 140-page guide on the formation of a K-9 unit in a small police department. Geiger and Goodman stated it would cost about $30,000 to create the program and another $1,000 a month for ongoing training. A specialized vehicle would require additional funds. The officers mentioned Peters could pursue grant opportunities. As justification for forming a K-9 team, Geiger and Goodman wrote that the Pismo Beach Police Department has stated its K-9 unit does more work and finds more drugs when assisting Grover Beach police than when working on Pismo Beach cases. Geiger and Goodman estimated a Grover Beach police dog would be used every day. Following the December attack, Geiger turned Neo over to San Luis Obispo County Animal Services, which euthanized the dog. Animal Services completed its investigation into the incident in late December and submitted the case to the SLO County District Attorney’s Office. Prosecutors have yet to announce whether they will file charges against Geiger. As of last week, Geiger remained on paid administrative leave. (a) Any person who willfully and maliciously and with no legal justification strikes beats, kicks, cuts, stabs, shoots with a firearm, administers any poison or other harmful or stupefying substance to, or throws, hurls, or projects at, or places any rock, object, or other substance which is used in a manner as to be capable of producing injury and likely to produce injury, on or in the path of, any horse being used by, or any dog under the supervision of, any peace officer in the discharge or attempted discharge of his or her duties, is guilty of a public offense. If the injury inflicted is a serious injury, as defined in subdivision (c), the person shall be punished by impreisonment in the state prison for 16 months, two or three years, or in a county jail for not exceeding one year, or by a fine not exceeding two thousand dollars ($2000.00), or by both a fine and imprisonment. If the injury inflicted is not a serious injury, the person shall be punished by imprisonment in the county jail for not exceeding one year, or by a fine not exceeding one thousand $(1000.00), or by both a fine and imprisonment. (b) Any person who wilfully and maliciously and with no legal justification interferes with or obstructs any horse or dog being used by any peace officer in the discharge or attempted discharge of his or her duties by frightening, teasing, agitating, harassing, or hindering the horse or dog shall be punished by imprisonment in a county jail for not exceeding one year, or by a fine not exceeding one thousand ($1000.00), or by both a fine and imprisonment. (c) Any person who, in violation of this section, and with intent to inflict such injury or death, personally causes the death, destruction, or serious physical injury including bone fracture, loss or impairment of function of any bodily member, wounds requiring extensive suturing, or serious crippling, of any horse or dog, shall, upon conviction of a felony under this section, in addition and consecutive to the punishment prescribed for the felony, be punished by an additional term of imprisonment in the state prison for one year. (d) Any person who, in violation of this section, and with the intent to inflict such injury, personally causes great bodily injury, as defined in Section 12022.7, to any person not an accomplice, shall upon conviction of a felony under this section, in addition and consecutive to the punishment prescribed for the felony, be punished by an additional term of imprisonment in the state prison for two years unless the conduct described in this subdivision is an element of any other offense of which the person is convicted or receives an enhancement under Section 12002.7. (e) In any case in which a defendant is convicted of a violation of this section, the defendant shall be ordered to make restitution to the agency owning the animal and employing the peace officer for any veterinary bills, replacement costs of the animal if it is disabled or killed, and the salary of the peace officer for the period of time his or her services are lost to the agency. Leg.H. 1984 ch. 443. effective July 12, 1984, 1985 chs. 106, 765. What this is saying is that if you irritate or injure a K9 police officer, you’ll be fined and jailed, and then required to pay for vet bills, replacement costs for the animal and the salary of the police officer for his/her time lost. So, perhaps DA Dow is correct to not bring charges against Neo’s trainer, owner and handler, officer Geiger. Perhaps it’s Mr. Fear and Mrs. Long who need to be charged with crimes? 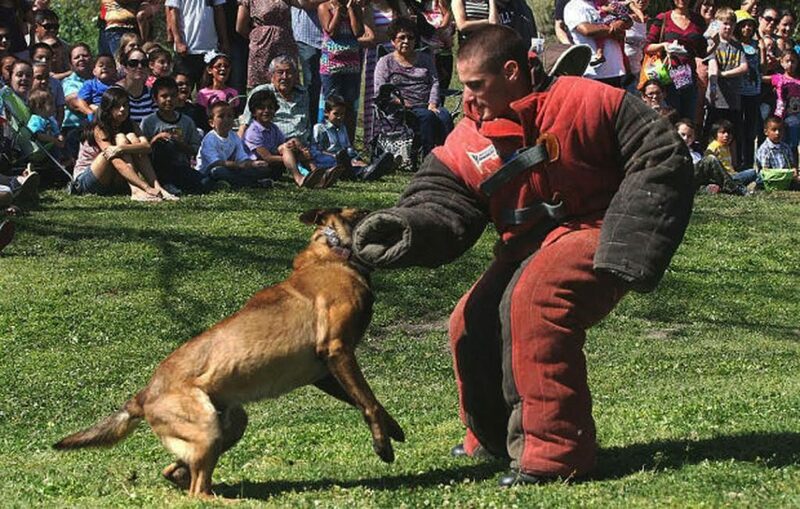 Afterall, the K9 officer was doing what it was trained to do before Mr. Fear intervened and assaulted the dog. The section of the CA penal code cited above only talks about the punishment one of us serfs would endure if we dared to irritate or injure a police K9 officer. Entirely missing is any language that threatens the K9 officer with punishment for misplaced aggression. Perhaps we’re not seeing this correctly? 1. The life and work of a police officer—including a K9— is more important and of more worth than the lives of any serf or group of serfs. 2. K9 handlers are not responsible for injuries to serfs. Why should they be? Serfs aren’t of any importance. Most should be put in jail for breathing the same air as the police officer or his dog. Police are never wrong and are never responsible for anything when it comes to serfs. Serfs are expendable. If one is accidentally killed by a police dog, another will take its place. Serfs are a dime a dozen. K9 officers are special and precious. Your life and your rights ain’t worth $h!T compared to a dog owned by a police officer! I know this last statement sounds harsh and “over the top” but just look at the INSTANT fines and charges that would have been leveled against Mr. Fear if he had bit Neo over at Neo’s house AND COMPARE THAT TO THE PAID VACATION THAT GEIGER IS ENJOYING. Again….if this is allowed to stand it is to our shame.